I especially liked how nice the staff was. Especially the maids. I'm sorry, I don't know if that is the properly term. They were extremely helpful and nice. Great place to stay in Chandler. I was surprised by the room; better than I thought. Breakfast was disappointing. Where to find Chandler hotels near an airport? How can I find hotels in different Chandler neighborhoods? Where can I find hotels in Chandler that are near tourist attractions? From the budget level to the more luxurious, Chandler offers a broad selection of great accommodation choices. Expedia's comprehensive database has 32 hotel options that are within a 0.1-kilometre (0.06-mile) distance of central Chandler. 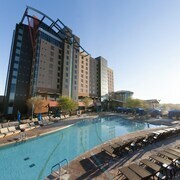 The Crowne Plaza Phoenix - Chandler Golf Resort is a favourite hotel choice because it is so handy to Chandler's town center. Families, students and those watching their budget can select from some lovely Chandler accommodation options that won't raise the bank manager's eyebrows. 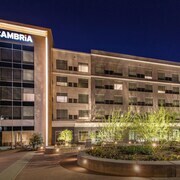 The Crowne Plaza Phoenix - Chandler Golf Resort is 0.1 kilometres (0.1 miles) from the main part of Chandler, while the Hampton Inn Phoenix/Chandler is 12 kilometres (7 miles) away. 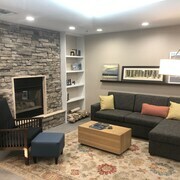 Additional budget accommodation options include the Fairfield Inn & Suites by Marriott Phoenix Chandler and the Fairfield Inn & Suites Phoenix Chandler / Fashion Center. 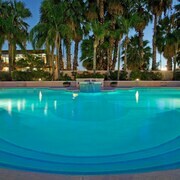 The Sanctuary on Camelback Mountain Resort and Spa can be found 25 kilometres (17 miles) from the main part of Chandler. Another hotel is the The Canyon Suites at The Phoenician, Luxury Collection, which is situated 25 kilometres (15 miles) away. Two more Expedia-listed hotels are the The Phoenician, a Luxury Collection Resort, Scottsdale and the The Camby, Autograph Collection. Keen on seeing more of the desert landscapes this area offers? Why not spend a few nights in some of the other places in Central Arizona? You can travel to local attractions or have a go at mountain biking, hiking and quad biking and then find a convenient place to stay the night. Looking for more things to do? Consider spending some time discovering Scottsdale Fashion Square and Casino Arizona, which you'll find in Scottsdale, 25 kilometres (14 miles) to the north of Chandler. The W Scottsdale and JW Marriott Camelback Inn Scottsdale Resort & Spa are just some of the great hotel and apartment alternatives in Scottsdale. 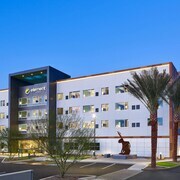 30 kilometres (19 miles) to the northwest of Chandler, is Central Phoenix - Downtown, home to the Holiday Inn Express Hotel & Suites Phoenix Downtown-Ballpark and Hilton Phoenix Suites. The Comerica Theatre and Arizona State University - Downtown Phoenix are some of the most popular attractions to experience for those visiting Central Phoenix - Downtown. Sky Harbor International Airport is a convenient airport, and is 20 kilometres (13 miles) away from Chandler. 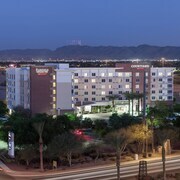 Conveniently located hotel options are Phoenix Airport Marriott and Phoenix Marriott Tempe at The Buttes. What are the most popular Chandler hotels? Are there hotels in other cities near Chandler? 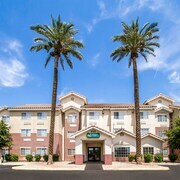 What other types of accommodations are available in Chandler? Explore Chandler with Expedia.ca’s Travel Guides to find the best flights, cars, holiday packages and more!